Apologies for the lack of updates. I’ve been extremely busy with November! Especially with the launch of Bloom. 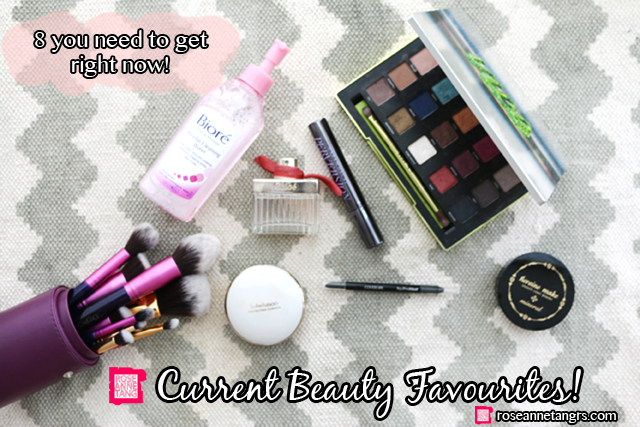 Here’s are my current beauty favourites! Biore Micellar Cleansing Water – Bioderma’s new competitor. This cleansing water is just like water but removes make-up just as well as their make-up wipes. I love the Biore make-up wipes, they are the best you can get in Singapore right now so I’m happy they made this amazing cleansing water. It’s easy to remove eyeshadow glitches without making your entire eye oily. Something you should for sure have on your vanity. Urban Decay Vice 3 Palette – My go to palette these days. I love how it has a mix of wearable and crazy colors and of course the shadows are all of amazing quality. I really love this palette and I think it would make an amazing gift this holiday season for any make-up junkie. Urban Decay Perversion Mascara – I was pretty skeptical when this came out but it’s one of my favourite volume packed mascaras out there. It does well even if you don’t have an eyelash curler. It really does add fluff to your lashes and it looks great. Chloe Rose EDP – My go to perfume of the moment. I can’t live without this and need a re-fill pronto. I’m running out fast but it’s my go to scent. Smell this, and it smells just like me. It’s the most beautiful rose scent on this planet. Sulwhasoo Perfecting Cushion – You know I love a good BB Cushion and I found my current favourite from Sulwhasoo. I’ve hears so many people talking about this brand and finally got to try it and it is amazing. Lives up to its name and I like it better than the Laniege pore control simply because it really looks natural on the skin while still provides great coverage. Heroine Make Smooth Cover Powder (Mineral)– The perfect pressed powder. When I apply this, my face becomes ridiculously smooth and paper like in a good way. I haven’t seen a powder like this yet so this is really special and worth getting if you need something to smooth out pores and set your make-up. Covergirl Liquidline Blast Pencil Eyeliner – The best staying pencil liner ever and a favourite from my Uni days. Unfortunately only sold outside SG which has Covergirl. I brought back a few for my classes when I came back from Melbourne. If you are overseas though, please get this eyeliner. It is amazing and stays on your eyes and doesn’t smudge (for me at least). 13rushes Bloom Set – I know, you’re probably thinking oh it’s her set which is why she’s putting it in here. Well, all for good reason. It’s everything you need in one set and I use the same set to teach my classes at Bloom. I love 13rushes brushes – amazingly soft and everyone I recommend it to loves it just the same. If you haven’t got a set, you need to! Hope you liked this quick update! Chanel Christmas 2014 Collection & Tutorial! Holiday Make-up Tutorial ft. INGLOT Freedom System!